I’ve been baking a lot lately, which isn’t a bad thing, just strange given that I haven’t done much baking over the past year or so. When the site first started it’s practically all I did. Speaking of which, starting that is, my veganisery was a few weeks ago, July 7! Totally forgot about it. So it’s been 2 years since I went vegan, 2.5 since I went veg. It seems longer, as in I can’t remember why I ever ate meat or enjoyed it. Someone asked me yesterday (he’s cut out all meat but chicken, interestingly what I did before I turned veg) if I ever miss meat. It was an easy answer–no. I never have, not even in the early days. I remember the last meat I had–some nasty orange chicken dish at a cheap Chinese place–and it was totally gross. There was no going back after I realized how gross cheap meat is. I do occasionally miss cheese and eggs, but not for taste. I miss cheese because I miss eating it while drinking a nice glass of wine. I miss eggs because they were so darn convenient. When I became a vegetarian I ate an egg every morning. It was great having that easy source of protein. Totally environmentally degrading, but easy nonetheless. I have decided that whenever I get my own house with my own yard I will have chickens. I would love to have environmentally and ethically responsible eggs–something I don’t see as an option unless I personally feed, clean, and love the chickens who lay them. One day. I guess I won’t be a vegan then, but I’m not too attached to the movement as a whole–just the way of living environmentally and ethically in the red. So on to the recipe. After my farmer’s lovely gift last week I knew I needed to bake something to say thanks. Given that I’m moving in…oh my gosh…3 weeks or so, I’m trying to clean out extra pantry items. Sitting on the corner of my flour shelf (yes, I have an entire shelf devoted to flour) was a bag of buckwheat flour. I’d never used it, just picked it up on a whim from the bulk section of the coop. But I wanted something to put in the bread, give it a little pizazz. Thankfully my boss had just donated some springs of rosemary from her garden and I had some oregano left over from the gift last week–fresh herbs! Then, because they ought to go in everything of course, I rehydrated some sun dried tomatoes and chopped them up super finely. Using my so awesome I can’t get over it Kitchenaid mixer, making the bread was a whizz. The end result is a dense yet sweet and chewy crumb–perfect for soups. The intensity of the buckwheat was calmed a bit by the sun dried tomatoes and the fresh herbs gave it a nice Italiany kick. I’d recommend the recipe more for winter than summer, the density makes it perfect for a warm and hearty meal, but I’m pretty proud of the result. Maybe I really can do this whole make up your own recipe thing! In a large bowl (or the mixer’s bowl), combine the water, sugar, and yeast. Allow to sit for 10 minutes until the yeast is frothy. Add the salt, sun dried tomatoes, herbs, buckwheat flour, and whole wheat flour and mix with a spoon or with the mixer’s paddle until well combined and a dough begins to form. If using a mixer, switch to the bread hook. If using a spoon, continue to do so until a ball of dough forms, then continue on to knead. Slowly add the bread flour 1/4 cup at a time until a ball of dough (moist but not sticky) forms. If using the mixer, leave the mixer on at medium speed with the dough hook for 5-7 minutes. If using your hands, knead the dough for 10-12 minutes. Transfer the dough to an oiled bowl, cover with a towel, place in a warm (but not hot) place (I use the inside of my oven if it’s not turned on), and allow the dough to double in size for approximately 1 hour (it might take longer). After the dough has doubled, punch it down, then divide it into 8-10 equal pieces. Form rolls. Place on an oiled baking sheet, cover again with the towel, and place the rolls back in the warm place and allow to rise for another hour. After an hour has passed, preheat the oven to 350F (remove the rolls from the oven if that’s where they’re proofing). Once the oven is preheated, cut x’s in the top of the rolls, then put them in the oven and bake for 35-40 minutes, or until the bottoms are golden brown. Mmm, what a great flavor combination! I’m impressed! I bake a lot of bread but am shy about making up my own recipes, though I have no problem making any other recipes. And it sounds absolutely delicious! Hey YOU! Happy Veganiversary! Those look great! I love savory herb breads… mm…. sadly i don’t have a kitchenaid but I may still have to try those! i looove baking. these rolls look so good! i don’t make enough bread. probably because i wouldn’t eat it all and there isn’t enough room in my freezer. i feel the same way about being vegan. i do occasionally miss eggs or cheese, but really only when they are in front of me. they are super convenient, and everyone says what a good source of protein they are. but really, not so much for the taste. vegan things are tasty too! Humid summer days are the best time to make bread, if you ask me. The yeast just loves the warmth, and loaves rise in no time! Great looking rolls, and what wonderful fresh flavors. That sounds like a fantastic flavour combination. 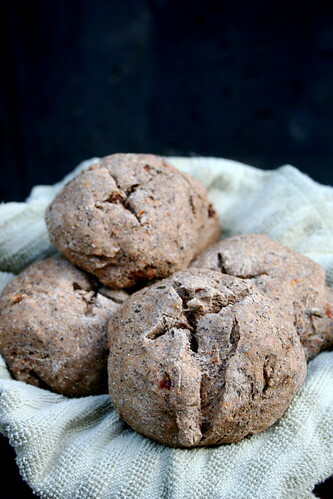 I wanted to bake some bread with buckwheat for weeks now. Mmmmm, must buy dried tomatoes. I’ve never baked with buckwheat. But I can imagine how wonderful the mediterranean flavors in this must have tasted! Howdy, ive just stumbled across your blog! These rolls look amazing! perfect with soup i would imagine. The flavours you added sound like they would go perfectly together.